Insert your image into the frame on the Internet. Picture frame Online virtual Frame & Edge Effects for Digital Photos. Easy Apply decorative frames and artisitc shapes to your photos. Quickly and easily add effects to a series of images. The program is extremely easy and convenient to use. wedding card design,wish card design ( Print on paper , A4,get many cards )Print photo frame online. 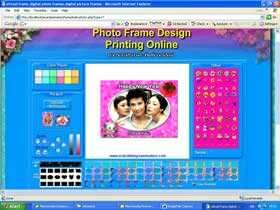 Drag & Drop graphics to create your own photo frame to use in yourprint them out to give to friends and family. Design your own frames . We like to print our photo frames out on photo pape. Click on the image. Try to put images into the frame.